Our influence on the climate is minor but beneficial. Wow, that’s very certain. No caveats or uncertainties. Not very scientific in my opinion. The mean residence time of a CO2 molecule in the atmosphere is 7 years, so the AGU must recognize that its earlier fears that anthropogenic emissions will influence the climate system for millennia have proven unfounded. Yet the models have consistently over-predicted global atmospheric and oceanic warming. According to satellite measurements, for 16 years 8 months, or 200 months, there has been no global warming at all. it is known that much of the loss of Arctic sea ice is attributable to natural influences, and half of that loss since 1979 has been compensated by increases in Antarctic sea ice. The first part of this statement is completely at odds with current scientific evidence. Arctic sea ice is reducing faster than even the models predict. The latter part of the statement is largely irrelevant. As I try to explain in this post, from a global warming perspective, Antarctic sea ice is not really relevant. It may have significance with respect to climate change (i.e., that it is happening) but isn’t really an indicator of global warming and certainly doesn’t compensate for the loss of Arctic sea ice. So, Monckton also discusses how everything we’re observing now is consistent with the range of possible natural variations (no, there’s not really any evidence to support this) and makes some very definite statements about how we’ll benefit if warming does continue (no, there’s no evidence that this is true either). Anyway, I should probably stop rebutting what Monckton says as he keeps regurgitating all the same arguments that many have already shown to be wrong (or, at least, have no evidence to support). That’s really all I was going to say. The AGU statement seems very measured and sensible. Monckton’s just seem wrong. This entry was posted in Anthony Watts, Christopher Monckton, Climate change, Global warming, Watts Up With That and tagged AGU statement, American Geophysical Union, Christopher Monckton 3rd Viscount Monckton of Brenchley, Climate change, Global warming. Bookmark the permalink. 27 Responses to Watt about Monckton and the AGU? Seems? Almost always he his wrong. Even in the rare cases when Monckton has a point, or is factually correct, he often gets something wrong. Or stretches what is correct beyond what it is capable of supporting. He also keeps repeating the same points when this is pointed out to him. Even from the very authors of the papers he’s using for his arguments. I really don’t know what to make of Monckton because of this type of behaviour. That Monckton is beyond reason is no surprise, but that the comments to such a text are mainly positive is surprising, even for WUWT. How much better can these people show their disregard for evidence. I have always wondered about the climate ostriches claiming that natural variability is so small that it could not explain the 0.2°C deviation in the last 16 years, whereas they also claim that natural variability is so large that it explains the full 1 degree increase we have seen since pre-industrial times. Both types of claims are always greeted with broad approval in the comment. I have yet to see words of caution and reminders of the opposite claim. And now, we even have a Lord that manages to put both claims into one text. I climate change would not be a serious matter, it could be a reason to roll on the ground laughing until the sun sets. So much spin and half-truths, it hurts my head. I guess someone should pick it apart. I won’t do it and it is probably useless anyway, but ‘for the record’ would be nice. Monckton knows he is lying through his teeth (as well as around them) but he doesn’t care. Why does it he do it? Is it the attention he is getting? The wrath of the born aristocrat not being a peer in the House of Lords? The only way he is not sinking into obliviance? Anybody knows anything about his finances? Contrarian at heart? As said my head hurts from reading the shoddy piece. Most comments applaud the piece, sceptical behaviour almost not seen. I guess the AGU (when someone points them to the piece) will simply ignore it. So should everybody else (except the one that picks it apart for posterity). Question is. The people at WUWT lauding the piece as a scientific masterpiece. Are those comments serious? Should one contravene? Are those commenting there beyond reproach? Are there WUWT lurkers who would benefit from counter opinion? Thus my question is: should one go over to WUWT and record monckton’s errors and be abused by the regulars in the hope that some lurkers benefit? 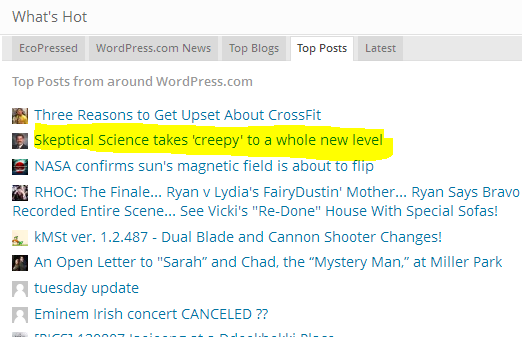 Watts has been bragging that his blog traffic has been up lately. Due to what, sexist chauvenistic posts from Willis, posting hacked joke photoshopped photos from SkS, and this utter stupidity from Monckton? Pingback: The AGU climate policy statement as redrafted by Monckton | Wott's Up With That? Absolutely fantastic post. Just want to add one bit. 2. Melting ice and thawing tundra. 1. Slightly faster but about in line with model predictions. 2. Much faster than model predictions. 3. Slightly slower but in line with model predictions. Since we can correct for natural variability, we find that when doing so atmosphere and ocean warming are spot on (1 and 3). The somewhat disturbing bit is that we find models have consistently under predicted sea ice melt, ice sheet melt, and tundra thaw. When we add these factors, we find Earth is warming faster than predicted and that ice feedback is somewhat more rapid. Overall, though, the models have been impressively accurate especially when you consider the complexity of the task at hand. I wonder how many of WUWT’s visitors are people like us who disagree with most of what he says. I’m beginning to think we need to make a concerted effort not to support his website statistics. Was it Victor who suggested using the nofollow tag? I think that’s a very good idea as the more links to WUWT there are the higher his site appears in the search results and the more traffic he will get. I also rarely visit the site as between your site and HotWhopper I can get a gist for what is being said without adding to his traffic. Is there some other way we can read the misinformation without adding to his stats? It would be interesting to know how many go who disagree. I do find it a little addictive. You read bits until you just can’t take it any more, but then you can’t resist going back to see what new things they’ve managed to come up with. After Victor’s suggestion I’ve started trying to remember to use the nofollow option in my links. In a sense, it is the kind of site that we should be able to ignore. The problem is, in my opinion, that others who actually have a platform (politicians, Delingpole, Andrew Neil) are clearly getting information from it. While that still happens I can’t see what else to do other than to try and point out what WUWT is getting wrong and hope that some people notice. As far as picking it apart is concerned, it just seems difficult because some of it is just wrong. I don’t really know how to rebut something that’s just wrong without simply saying, “it’s wrong” and that’s just a bit weak. So, I just picked a couple of things that were easy to show were scientifically unjustified and left it at that. People can, to a certain extent, make up their mind about the rest based on this. I tried going to WUWT a while back and the abuse just wasn’t worth the effort. Maybe some reading but not commenting might benefit, but the typical commentators appear not to be willing to consider alternatives. One would hope that those who might be willing to consider alternatives might be looking elsewhere anyway and so pointing out the errors somewhere else could have some benefit (I hope). Anthony Watts introduced the Alexa spy bar. That as the moment his traffic went up recently. There’s an old saying that Anthony has forgotten concerning quality and quantity. Yes, that was my understanding – it’s just another trick, basically. Thanks. I agree and it’s this sort of discussion that, I think, scientists should be engaging in with the public to convince them that the evidence is extremely strong. Amongst the problems, of course, is that some media outlets keep telling people that climate scientists can’t be trusted and others prevent them (Andrew Neil, for example) from talking about anything but surface temperatures. In a sense that’s why I’ve become ever more frustrated by the Guardian articles by Warren Pearce and Tamsin Edwards. They appear, in my opinion, to be pandering to those who would like to close down proper scientific discussions rather than doing what I think should be done, putting effort into convincing the public and policy makers that we should stop listening to untrained and unqualified pseudo-sceptics and start listening to professional, experienced climate scientists. According to the WUWT “success” post, the main reason is the hacked photo collection. First evidence suggests that the “success” is all hot air due to the Alexa spybar. What’s the hacked photo collection? That’s not surprising. WUWT is starting to resemble the Daily Mail. The creepy post in particular is nonsense and pointless but just like the gossip at the Daily Mail, the masses seem to want to read it. That letter from Willis to Marcia McNutt is pretty condescending and laughable. The WUWT claim is that people at SkS did this themselves? Surely the simplest explanation is that these are examples of photoshopped defamations that have been sent to SkS by readers encountering them in what is sometimes called “the denialosphere”. Would you mind linking some examples of these Guardian articles so I can remain more alert to them? I wholeheartedly agree about shutting down the deniers. My opinion is that we need to both point out the weaknesses in their arguments (what you do very well) and to shine a light on where they have generally been proven right as well as identify ongoing changes to the climate system as they are happening. The media, I believe have been generally terrible at both. Wotts, (or any other WordPress blogger), can you see a graph with your pageviews on the dashboard of WordPress, just as with Blogger? If yes, I “wonder” why Watts did not show a screenshot of this accurate graph and preferred an inaccurate estimate by Alexa instead. On ‘picking apart’ I wouldn’t know where to start. On commenting on WUWT I am not sure where to start either. I don’t see many over there trying to stem the ‘ostrich tide’ over there anymore. Anthony seems to wait for an opportunity to ban people and then does so, while maintaining his position is having an open discussion. It is simply not true, he bans people he doesn’t like when he sees a reason (justified or not). Doesn’t stop the commenters on WUWT complaining about censorship on other sites (e.g. Guardian). Have been there myself. Reasonable discussion is really exceptional. No way to change the regular commenter’s minds. WUWT has been dealing biased information for years. The faithful don’t see the logical inconsistencies being dished out quite often. To them there can only be one result in the discussions. @Victor: I’ll also post here what I said on my blog. I don’t know if it’s on his dashboard, but I do know WordPress has statistics capabilities. You can see that Watts has this running thanks to the little smilie face you see if you scroll down to the bottom of one of his pages. Also self hosted WordPress blogs, like mine, can have this capability if you install the JetPack plugin by WordPress. It enables features you would normally only have if you’re on the WordPress environment. I would be very surprised if Watts wasn’t aware of this WordPress feature. However, I wouldn’t speculate on any nefarious reasons as you can’t know his motivations. Other sites often don’t publish their web traffic statistics so he doesn’t have any data from them to compare with. So it’s him using what he has available to compare traffic. What you can criticize him for is that what he’s using isn’t reliable and any conclusions you draw from that data will be wrong. You can also criticize him for ignoring people who point this out to him. There is going to be a follow up post by me explaining the issues with Alexa and how Watts treated me when I hinted at this. Wotts, funny that Watts is complaining on Twitter about your use of “Watt about …” for your post titles. He used this word play himself, already his second WUWT post was titled: Watts Up with PS3? The jump (success) is pure deception, again, nothing happened the last few months. The revenge has been cancelled. My new post on the Alexa traffic jump of WUWT shows the details.